The only time you will have into it is when it is simmering for 2-1/2 hours; turning itself into a hearty, delicious sauce. Mmmm is what you will hear after making this bolognese sauce. If you love Italian food, this sauce is perfect for lasagna and makes a killer spaghetti meal. No hunter should be without these venison recipes. More game recipes at the end of the page. Ground venison was used for the photo above. My favorite is with the roast (venison, beef or pork). This is just a foundation recipe - I am giving you the basics and you personalize it yourself. If you want more mushrooms and no celery; that's up to you. Create your own masterpiece today. What makes this home cooked meal even better is serving this over pasta, making homemade garlic bread, and having a fresh salad with homemade salad dressing. 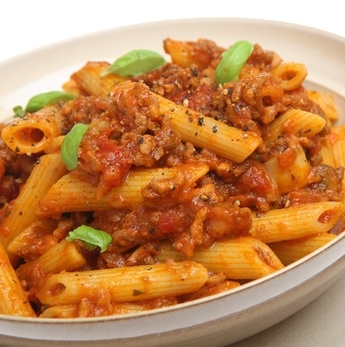 This venison bolognese sauce is very versatile and a tasty way to use venison, beef or pork.